A 4mm 3-plank open, with 'round' ends, in red livery by Mikkel Kjartan, built from a David Geen kit. Details of the build are given on his blog. 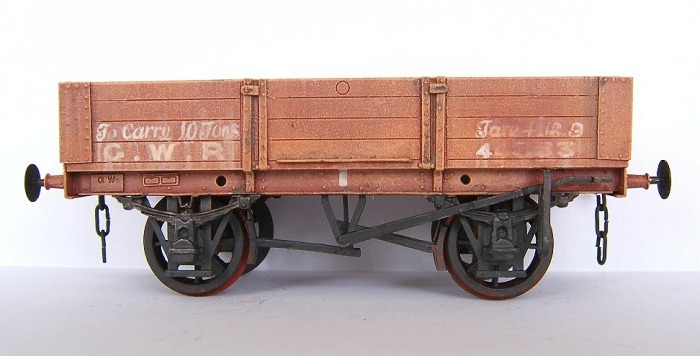 Another 4-plank open by Mikkel Kjartan, from a Cooper-Craft kit, but this time featuring the rarely-modelled Thomas brake, used on a limited number of wagons from 1896–1902 but never widely applied. In the following notes, John Lewis discusses some of the evidence of when the livery changed from red to grey and makes his own suggestion. John's notes were originally provided as part of a discussion on the GWR e-list. A collection of other references on the red wagon livery are also provided below. Many thanks to John for his notes, and to Ian Espiner, Mark Austin and others from the GWR e-list for additional information.
" We don't know when the changeover from red to grey wagon livery officially took place, or exactly what was the colour. Unfortunately you cannot tell the difference between red wagons and grey ones in monochrome photographs taken using orthochromatic film (i.e. blind to red). "... even its trucks are cheerfully coloured a warm red, probably the only decided red trucks going." The obvious date of change is c 1904 when the large G W was adopted [because of the Collins article mentioned above, ed]. Alternatively it could have been with the adoption of the cast iron number plates, although that seems to have been spread over some time. I have not yet found any contemporary reference to a changeover in colour in the 1870s [as suggested by Slinn, see below] or 1898. This is not to say it is wrong, it is just that I cannot find any evidence for it. However, there is no guarantee that the colour change coincided with a livery change. It is all very frustrating. There ought to have been a circular issued instructing the C&W staff to paint wagons grey, but no signs of it so far." * Webmaster's note: the use of 'general' in describing the adoption of the cast wagon plates is misleading, because contemporary photos indicate wagons with cast plates were greatly outnumbered by wagons with painted numbers. In Great Western Way, pages 89–91, J.N. Slinn refers to light red ceasing to be used towards the end of the 1870s, but also refers to an assertion in Moore's Monthly Magazine for March 1896 that "the general run of Great Western wagons was painted light red from the first days of the Railway's existence until the nineties but that goods brake vans had changed to a grey body colour during the previous decade." In GWR Goods Wagons, page 64, Atkins, Beard and Tourret write: "Before about 1898, a light red colour had been adopted for the wagon stock with white lettering, but the goods brakes were grey. Some wagons, perhaps the service wagons, were black. About 1898, the well-known dark grey with white lettering was introduced." In Britain's Railway Liveries, Ernest Carter refers to an 1896 change from light red to grey livery, but also has another reference to "wagons dark red and grey" as late as 1914. Hamilton Ellis writing in Our Home Railways talks about GWR goods stock being red (as well as grey?) in 1914. The artist Nigel Digby who has done a series in British Railway Modelling on pre-grouping liveries has made an attempt at illustrating the GWR red wagon livery in the 1890s (see British Railway Modelling January 2003). He describes and illustrates it as "Light red, white lettering "G.W.R". When going through the RAIL 253/147 archives (miscellaneous circulars, handbills & instructions 1835–1947) at the Public Record Office, Mark Austin had a look to see if there was anything on the wagon livery change, but found nothing. The Locomotive Volume 1, No. 3, March 1896 states: "A light red colour is adopted for the wagon stock with white lettering but the goods brakes are a dark grey." Webmaster's note: The above illustrations show red applied to metal solebars. 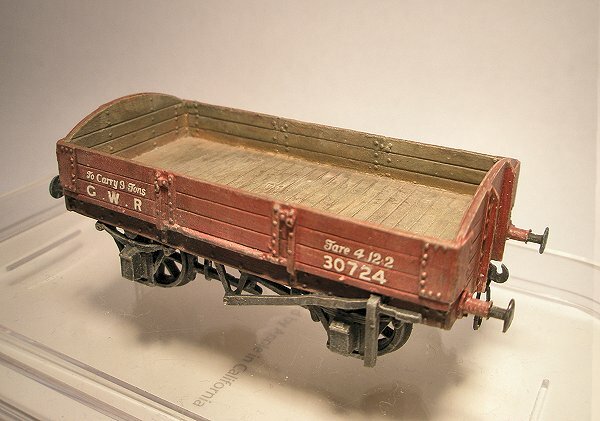 It is known that the GWR did start painting metal solebars on some wagons in black after 1888, to match the black of the running gear, but it is not known whether or when the black became generally applicable to metal solebars. In any event, 'all-over grey' was subsequently adopted soon thereafter.